Includes matte black frame and matte black Lancaster front. Overall dimensions of frame are 43 inches wide, 28 1/2 inches tall, and 1 1/4 inches deep. Overall dimensions of Lancaster front are 32 1/2 inches wide, 23 1/2 inches tall, and 1 3/4 inches deep. Front includes barrier screen for safety. Fits Innsbrook and Loft medium direct vent fireplace inserts. 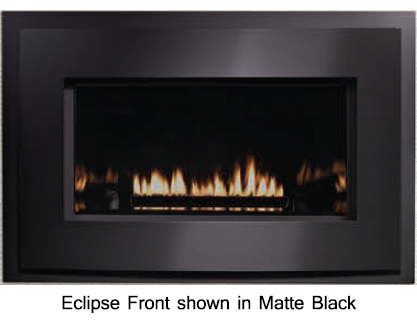 Includes matte black frame and matte black Eclipse front. 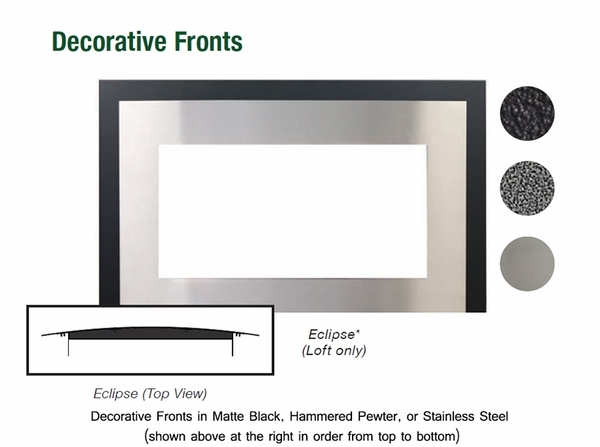 Overall dimensions of Eclipse front are 39 1/2 inches wide, 23 inches tall, and 4 3/4 inches deep. Fits Loft Series medium direct vent fireplace inserts. 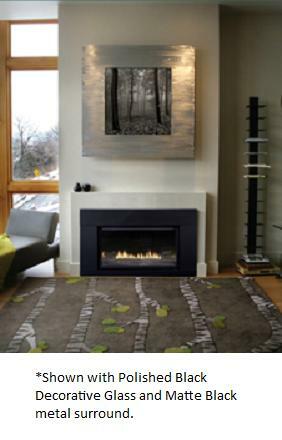 Finishing the venting installation of your Innsbrook direct vent gas fireplace doesn't have to be difficult. It can, in fact, be quite simple using this Empire DVKI2P Innsbrook Direct Vent Gas Fireplace Vertical Vent Kit. This kit includes one Empire sheet metal co-linear adaptor, one linear termination kit, one 3-inch x 35-foot flex extension kit, and one round hi-wind vertical top. In other words, if you want to vent your Innsbrook direct vent fireplace vertically and want to get everything you need to do it, this is the kit for you. Many venting difficulties can be addressed using this Empire DVK35 Innsbrook Direct Vent Gas Fireplace Insert Vent Extension Kit. This Empire fireplace extension kit is specifically designed for use with Innsbrook direct vent gas fireplace inserts and helps you solve some of the more common venting dilemmas surrounding installation of those appliances. The kit includes a 35-foot length of flex pipe, two connectors, and four clamps. In other words, this empire extension kit contains everything you need to finish the venting of your Innsbrook appliance, to vent it with maximum flexibility, and to finish the installation. This Empire 46DVAGK Linear Termination Kit is the perfect way to finish off the installation of your Innsbrook Direct Vent Gas Fireplace Insert. This kit provides everything you need to terminate venting of that heating appliance in a straight-line application. *Also Note: This unit is approved for mobile home installation where not prohibited by local codes. The Loft Direct Vent Medium Gas Fireplace Insert features a sophisticated, modern design and powerful, efficient operation that make it an incredibly popular choice for homeowners. This unit boasts a fantastic look and 27,000 BTU's to help you heat your home effectively. The fireplace itself features an efficient and dynamic burner, convenient co-linear venting, and a large heat-resistant ceramic glass window that give you a great view of the flames. Those flames look even better thanks to the included black porcelain liner, and the heat the flames generate is distributed for maximum comfort by the built-in variable speed blower. 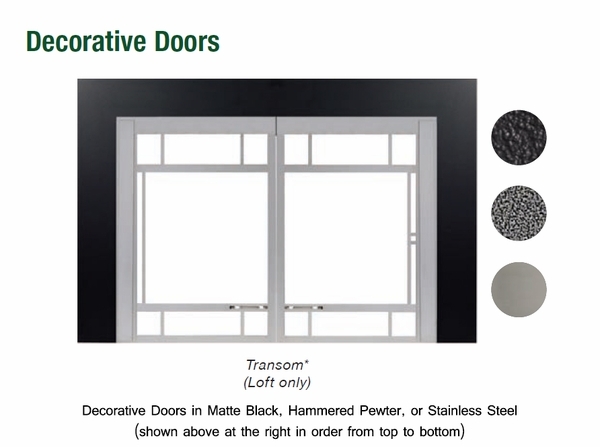 On top of all of these benefits, owners can choose from two different metal surrounds, plus the unit carries a 3-year limited warranty. There's also a fuel-saving intermittent pilot for simple, safe operation. You get lots of fireplace with a lot less expense and hassle when you choose the Loft to heat your home. This is more of a contemporary insert and would not arrive with any logs. Additionally, no optional logs are available. Yes, the basic four-sided matte black surround shown in the photo on this page is indeed included. Can home owner install this unit? No, this item must be installed by a licensed professional in order for the manufacturer's warranty to be valid and also for safety reasons. How many square feet does this product heat? The BTU rating of 27,000 for this insert is sufficient to heat up to approximately 770 square feet. Great looking unit with quiet blower, and great heating .